Christmas pudding is considered to be one of the richest desserts in the world. In most British families it is the main dish at Christmas. To tell the truth, Christmas pudding cooked in a proper way is so rich that it might be the last thing you’ll be eager to eat after plenty of ham, roast turkey or goose and vegetables that make a traditional Christmas dinner. Long time ago the main Christmas dish in England, Scotland and Wales was the plum pudding, the ancestor of Christmas pudding. Plum pudding appeared in 14th century as a porridge called “frumenty” and was made of beef and mutton with prunes (dried plums), currants, raisins, spices and wine. It used to look like thick soup that’s why it was eaten with a spoon and was usually served with the meat course. Little by little, people added eggs, breadcrumbs, ginger, cloves and other ingredients until frumenty became so thick that a spoon would stand in it. As you can see, the original Christmas pudding was not really a dessert at all! It will take you some time and effort to make Christmas pudding. During Victorian times rich families usually cooked puddings in the shapes of towers and castles while common people had their puddings in the form of balls. Place the fruit, chopped dates, raisins, water, sugar, salt and butter into a pan. Stir over low heat until the butter has melted. Simmer for 8 – 10 minutes, stirring occasionally. Remove from the heat and add baking soda. Allow to stand until the mixture is completely cold. Lightly beat together eggs and rum and stir into cold mixture. Add sifted flours, mixed spice, cinnamon and mix well till the mixture is combined. Put the pudding into a large well-greased dish and cover with a piece of grease-proof paper. Steam for 6 hours, adding some more boiling water every 20 minutes. Serve with whipped sweet butter or your favourite flavor sauce. Don’t forget to pour some brandy over the pudding. If you set fire to the brandy before bringing it in, it will be covered with beautiful blue flames! In the UK there are a lot of superstitions connected with this famous dessert. It is believed that Christmas pudding should be prepared with 13 ingredients to represent Christ and His Disciples. It is lucky to help make the pudding, so every member of the family takes turns to stir the pudding and make a wish. But to preserve good luck you should stir it clockwise with a wooden spoon. It is said that finding a silver coin in Christmas pudding brings wealth, health and happiness. Nowadays people in Great Britain put a five pence coin in Christmas pudding. 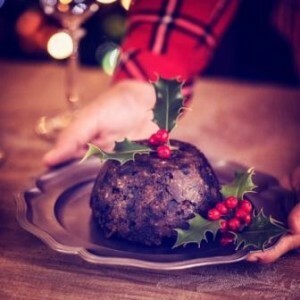 It is believed that if a single person finds a ring inside Christmas pudding he or she will get married within a year. On the contrary, finding a button predicts that a single man remains a bachelor and a thimble means that a lady remains a spinster. Did you know that eating Christmas pudding was illegal in Britain during the rule of Oliver Cromwell (1599 – 1658). Cromwell thought that the dish was so rich that it was peccable (=sinful) to eat it. Though it sounds too ridiculous but he just forbade it! Moreover, anyone caught eating it could be fined or sent to jail. According to Guinness World Records the largest Christmas pudding ever was made by residents of Aughton, Lancashire, in 1992 and weighed 3.28 tons. Эта запись написана автором Елена Шрамкова, 18.12.2015 в 15:52, и размещена в категории Christmas Time. Следите за ответами на эту запись с помощью RSS 2.0. Вы можете написать комментарий или разместить обратную ссылку на своем сайте.